The principal teaching at the Ballarat Karate Club is the traditional Shōrin Ryū Matsumura Seito system of Okinawan Grand Master Sōken Hohan (1889-1982). The Ballarat Karate Club is the sole organization in the world to be granted access to the only collection of films in existence of Grand Master Sōken demonstrating personally and with the assistance of his then most senior student Kise Fusei, the complete kata of his system. The Shōrin Ryū Matsumura Seito kata practiced by the Ballarat Karate Club remain entirely faithful to these unique reference works. 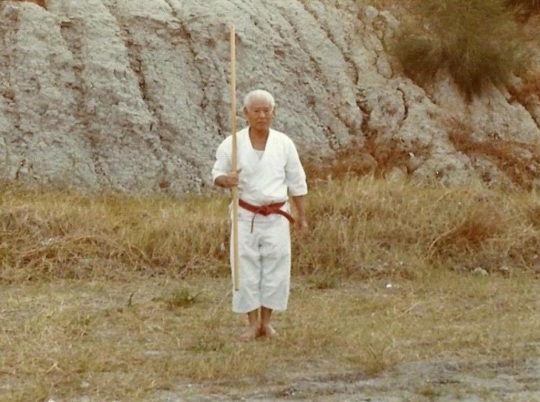 These films were taken on Okinawa in November 1973 using a hand-held Super-8 movie camera by Australian karate-ka Barry Packham and Brian Pilbeam at the specific direction of Grand Master Sōken. The Grand Master’s requirement in the gifting of this information was that it be used to provide a reliable long term reference for the teaching of his system by his formally accredited representative in Australia, Barry Packham. Apart from the original films held by Packham and Pilbeam, over the past forty-six years only one copy has been gifted to another person for their reference, being to Wayne Reddrop, Chief Instructor, Shōrin Ryū Australia. This gift was made by Packham at the Annual General Meeting of the Ballarat Karate Club in 2018. Grand Master Soken performing Chikin No Kon, Okinawa 1973. Note: Another still frame of these same movies taken by Barry Packham and Brian Pilbeam during the November 1973 filming can be found on page 7 of the kanji version (2000) of Grand Master Kise Fusei’s book “Okinawa Karate no Tamashi” (unattributed); and on page 11 of the 2003 English translation, titled “The Spirit of Okinawan Karate” (unattributed). An especially good full page rendition of this photograph (attributed) can be found on page 64 of John Shipes excellent tribute to Grand Master Kise Fusei of March 2011 titled “Hanshi-sei Fusei Kise’s OSMKKF”. © Copyright Ballarat Karate Club 2007. All rights reserved.